Barclays Bank is to expand its operations here, doubling its Irish workforce to 300 by the end of next year. 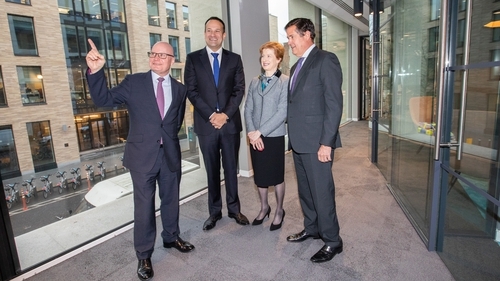 The announcement was made as the bank officially opened its new Dublin office building. The 37,000 sq ft property on Molesworth Street will act as a central hub for Barclays' banking activity across Europe. Currently 150 staff are employed there, but the company is growing its licensed activity here across corporate and investment banking, wealth management and card services. Barclays Bank Ireland has been operating in Ireland for 40 years. But last year the company revealed it was expanding its presence ahead of the UK's departure from the European Union. It took a 20 year lease out on the new property at One Molesworth Street and began shifting direct ownership of its French, German and Spanish branches from a British-based entity to its Irish bank. It is understood that the bank will have total assets of around €250 billion under management in Ireland after absorbing all the European business, making it the largest bank by assets in the country. The new hub will run the bank's European branch network stretching to Amsterdam, Frankfurt, Hamburg, Lisbon, Madrid, Milan, Paris and Stockholm. According to the bank, it will ensure uninterrupted services to Barclays clients, regardless of the potential outcomes of the ongoing Brexit process. The new building was inaugurated by Barclays Group chief executive Jes Staley and Taoiseach Leo Varadkar, who said the development was very positive. "Ireland has a very strong reputation globally as a top location for the International Financial Services Sector," Mr Varadkar said in a statement. "This is all the more important as we seek to attract investment in the Brexit era." "Securing this commitment from a long established, banking establishment like Barclays is a highly significant vote of confidence in Ireland's growing importance as a gateway into the single market," he added. Barclays has provided advice and finance over its history in Ireland to a wide range of clients, including Paddy Power, I-RES REIT, Cairn Homes Centre Parcs and An Post. "The choice of Ireland to be the focal point for our European operations was a clear one given the unique business and cultural links between the UK and Ireland and we are very proud to be playing a role in the continued evolution of financial services in Ireland," Jes Staley said. The news has been welcomed by the Minister for Business, Enterprise and Innovation, Heather Humphreys and the IDA. "Ireland's access to the EU's markets and regulatory systems has become increasingly important for Ireland post-Brexit," said Martin Shanahan, the IDA Chief Executive. "Companies based in the UK want to retain a foothold in the EU, and Ireland is the perfect location from which to do this."